By default, BNFW doesn’t add any notifications on installation so you’ll need to add some to get started. To add a new Notification, go to the ‘Add New’ menu item under ‘Notifications’ in the admin sidebar or click the ‘Add New’ button when viewing ‘All Notifications’. You’ll then be presented with a screen that allows you to create a new notification. The first thing you’ll want to do is create a title for your notification. This allows you to distinguish notifications from each other when viewing the ‘All Notifications’ screen. It’s purely a label for your benefit. You’ll then want to set your notification type. Please see here for a description of each notification. Here you can specify under what taxonomy and term conditions you want your notification to be sent (Conditional Notifications add-on only). Choose the ACF custom field(s) that you want to trigger the sending of this notification when updated (Custom Fields add-on only). You can choose between sending this email notification out as HTML with nice formatting, using the WYSIWYG editor or as Plain Text, showing all HTML inline. Either option is useful but depends on your circumstances on which you’ll want to use. Ticking the ‘Set “From” Name & Email, CC, BCC” checkbox allows you to customise the header of your email a bit more than normal. WordPress traditionally sends out emails from “WordPress” using a “wordpress@yourdomain.com” email address. If you’d like to change the default WordPress sender name and email address to something that sounds a little nicer, you can do so here. Additionally, for notifications that support it, you can set the user roles or users that will receive a carbon copy (CC) or blind carbon copy (BCC) of this email. You can select more than one. This is useful if you want to include other users in on emails but they aren’t necessarily the primary recipient. Please note: users/user roles in the CC and BCC fields will be included on every email that is sent out, so if you have multiple users in your Send To field, users/user roles in the CC/BCC field may receive multiple duplicate notifications. Some notifications will allow you to send the notification to the author of the post / page / trackback / pingback, etc. only. Clicking this checkbox will allow you to do this whilst still allowing you to add User Roles / Users as normal in the Send To box. This essentially stops you from receiving notifications about things that you’ve done. 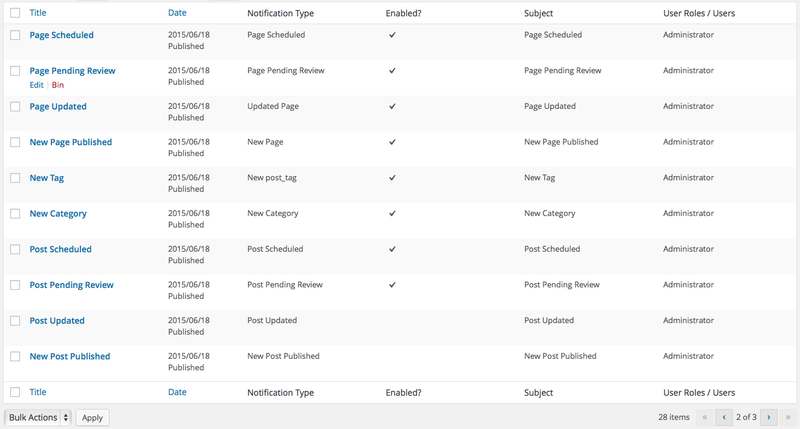 For example, you’re an Author and you have a notification for ‘Post Updated’ that sends to the ‘Author’ user role, and you update a lot of posts, you don’t necessarily want to be notified of this as you already know you’ve updated the post. Ticking this checkbox and saving it stops the notification from going through to you or anyone else that this might effect. Ticking the two checkboxes listed above on any New Comment, New Comment Awaiting Moderation or Comment Reply notifications, will prevent the post author from receiving notifications of their own comments and comment replies. They’ll still receive notifications of new comments from others though. Choose the user roles and/or users that you want to send the notification to. This will send a notification to each user (e.g. 100 users = 100 notifications sent). You can select as many as you like though. If a user is assigned to multiple roles, they will only receive a notification once and not once for every role that they are assigned to. If your site has more than 100 users, to prevent slowing down the WordPress Admin, the list of user roles and users in the ‘Select User Roles / Users’ box will be replaced with ‘live search’ instead. To use this, just start typing a username to load a list of matching users and select them as normal. A complete list of user roles will always show above the list of matching users but won’t show until a character is entered into the select box. This is the subject of your email and can include shortcodes. This is the body of your email notification and is where the fun happens – you can customise this to include HTML, formatting, shortcodes, you name it! Getting stylish with this will allow you to really spice-up your WordPress emails. If you need help with shortcodes for your chosen notification, there’s a link to the shortcode help section of this website to the left of the WYSIWYG editor. Please note: WordPress core shortcodes and shortcodes added by plugins that are correctly registered within WordPress are stripped from the BNFW shortcodes [post_excerpt] and [post_content] when added to your notification. This improves layout and styling within your notification and is generally desirable. Plugins that do no correctly register their shortcodes in WordPress will still show but may or may not render their content. By default, the WordPress WYSIWYG editor will wrap any content in paragraph (p) and line break (br) tags. If you’re having issues with formatting, try ticking this checkbox, saving the notification, and seeing if that helps. If you’ve installed BNFW because you want to customise a WordPress default email but don’t know what the original email subject and message body was, you can now click this button and BNFW will automatically insert these for you, complete with working shortcodes. 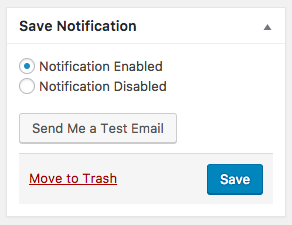 This only works with the default emails that come with WordPress core however – any new notifications that BNFW provides will still need to be created from scratch. If you want to stop this notification from sending out emails, you can disable it here. You can easily see which notifications are enabled or disabled via the ‘tick’ icon in the ‘All Notifications’ screen. 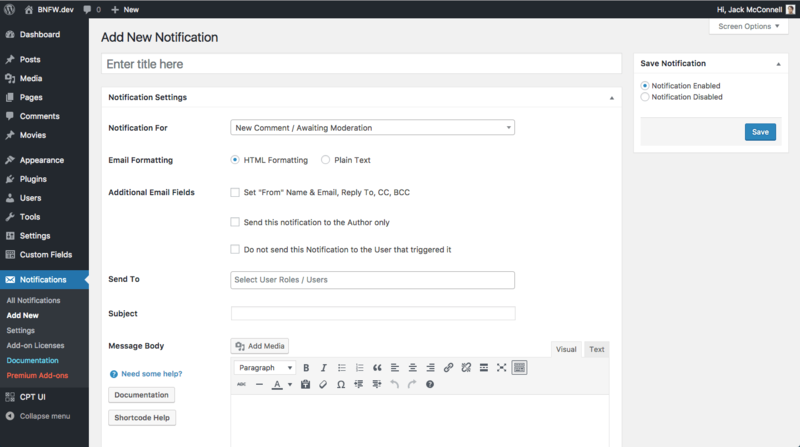 If you’re using BNFW to override a default WordPress notification (such as the ‘New User Registration – For Admin’ notification) it will disable the default WordPress email notification too. This button will show once you’ve saved the notification for the first time. Clicking this will send you (the currently logged in user, only) a notification so that you can check for any issues with formatting – it’s doesn’t necessarily prove that a notification will work in the future, just that it looks correctly when it does. Shortcodes will not be replaced with content.